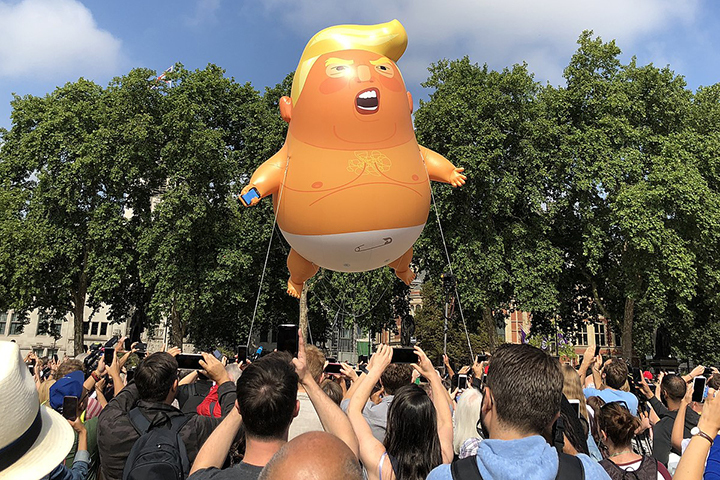 One of the big talking points from President Donald Trump’s visit to the UK was the first deployment of the Trump Baby - the floating oversized balloon that you’ve seen in countless stories. And you can argue that, since it gained so much attention, it was a stroke of marketing genius - a sign that the resistance to Trump is a vigorous force. That’s not how I see it at all. Instead, I see it as just another sign of the stupidity of mass campaigns. Since I’ve already offended half the readers and guaranteed they now will misinterpret and misread the rest of the article, let’s try to pre-empt the problems by tightening up a few definitions. By ‘stupid’, I don’t mean that anyone in the anti-Trump campaign is stupid. I mean stupid in the way that aggregate human behaviour is stupid. When you see a group of people wandering idly across the road completely oblivious to the traffic because they’re wrapped up in their conversation, that is stupid behaviour. It comes out when people are in groups, even though none of the individuals in the group would cross the road that way if they were on their own. Group Stupid grasps the shiny object of desire immediately in front of them with no plan or strategy in mind. Group stupid leads the small children to the evil wizard’s lair just because he left a trail of sweets for them to follow. Part of Group Stupid is just what happens by default when there is no genuine leadership, and therefore no organised processes. Another part is where self-identified groups become selective and self-referential in how they see the world. Let’s assume, because it’s reasonable to do so, that there was one opportunity to grab the spotlight for the Trump visit. One opportunity to get a message into wider circulation. There’s nothing guaranteed about that - it has to be a good idea that is newsworthy. The first question is this: what is the campaign aiming to achieve? And secondly, how will achieving that goal lead to concrete change to impact the perceived problem? Because that’s the point of campaigning, right? There are different answers to that question if you (a) have a blank page in advance of the opportunity or (b) are post-rationalising why you did what you did. If you ask the question in advance you have to confront this - are we opposing the individual, or the policy? “Both” is the lazy answer and almost always wrong. If you attack the individual and you are successful beyond your wildest dreams, the individual is removed. Are you happy if the policy goes on unaltered? If your main concern was one of competence - the individual was simply not competent to do the job - then that makes sense. And, given Trump’s record there is a good case to be made on the competence side. But a quick glance at the anti-Trump protests shows that a lot of the messaging is about a range of different policy issues. Basically, the protest movements are a mobilisation of the political left. You can understand that they may be especially offended by the mannerisms of Trump, but their real goal is policy change. It’s just that the Trump behaviour offers them a shiny object in immediate view they can grasp onto. There is a good case that the best thing to be done in that case would have been nothing. During the course of the Britain visit, Trump was seen to behave boorishly with the Queen, and then he went on from their to outrage opinion on all sides of the political divide at home with his warm endorsement of President Putin, and stagger people with the playground-sophistication of his rapid retraction. Arguably, avoiding distracting attention from his mis-steps was the most effective things a campaign group could have done, along with sober background lobbying of the sensible forces on his own side to draw a line under the damage such behaviour was creating. But campaign groups - and especially politically partisan ones - are egotistical. The fact is that left-identified groups abroad attacking and ridiculing a President is more likely to make the political right in the US show solidarity rather than the opposite. If removal of the individual is the goal, public ridicule and protest by the left is a poor tactical choice. The organisers remain oblivious to this possibility. Giddy from the attention they received, they boasted of “the enthusiasm of the people on the marches” and the news coverage as evidence of huge anti-Trump support created by their initiative. The Trump Baby, they said, had “given the world a uniting symbol”. For many, the protests were about policy change. The problem is that there were so many to focus on. Climate change. Immigrant family break-ups. Trade wars. Hard to address so many issues at once effectively - and that, of course, is why Group Stupid is what drives campaign groups. They want all the issues, because every one might appeal to someone, and so you get a heavily diluted message. If you genuinely want to create change on any one of them, you will have a different approach that is calculated to make the most impact. None of it involves a floating Trump Baby. Back in the 1980s, I remember the highly regarded campaign run by Ken Livingstone against the abolition of the Greater London Council. It ran full page newspaper adverts with the message “Say No to No Say”. Livingstone was pictured saying that if you wanted him out, you should have the right to vote him out. It was a targeted message aimed at the broadest political base on one single principle - political legitimacy. They had to fight to keep the campaign simple. All the campaigners around them wanted - if they were going to have full page newspaper adverts - to fill them with information about their anti-racism platform, their anti-nuclear policies, and every other favoured cause from a very long list. In that case, Group Stupid was contained and the campaign was effective. Although it narrowly failed to gather enough support to stop the change (Livingstone was the wrong person to spearhead the cause) in the short term, it wasn’t long before a democratically elected body had to be recreated. Indeed, the activist group that initiated Trump Baby was a climate change campaign - 10:10 (although they don’t reference the initiative on their website, which is about community action). In the Guardian they wrote in advance of the first outing that its use would create “a day of national pride and unity”, spreading “cheer and goodwill … as we remember our common humanity, and laugh together at the idiot president”. And there is Group Stupid right there. Group Stupid also, because it’s a group process, has little to no empathy for people outside the group. You could see that in some of the campaigners who said they were “standing with the American people” against Trump. In assuming that all the American people must surely agree with them simply feeds into the process that led significantly large numbers of them to vote for Trump in the first place. If challenged, I have no doubt - because I’ve seen it often - that campaigners would justify personalising the campaign by ridiculing Trump. But if you asked them to name their inspirations - people who led campaigns that were successful in history - the names that would most often come up are Martin Luther King, Nelson Mandela and Gandhi. All were very focused on the policy change. They neither lampooned nor ridiculed their opponents, but sought to recruit them and / or the people around them. And they managed to lead their respective movements accordingly even though, left to their own devices, those movements would have behaved tribally and much less effectively. None of this much matters, so long as it doesn’t get in the way of the grown-ups getting on with the job. Somebody has to tackle the process of getting climate change realism back as a mainstream force in the Republican Party in the US. That may be a loose affiliation of clear-sighted businesses working with moderates who can be persuaded to take a lead in a difficult political environment. Campaigners demanding that businesses make political stands don’t help that process - since partisan businesses will have much less influence in that role. The Trump protests are pure recreation for the people concerned. If the man himself does fall, it won’t be because of them. And if he does, they’ll just shift their target to personalise the next campaign around whoever takes over. Great community building for like-minded people, don’t get me wrong. It just shouldn’t be mistaken for creating social change.